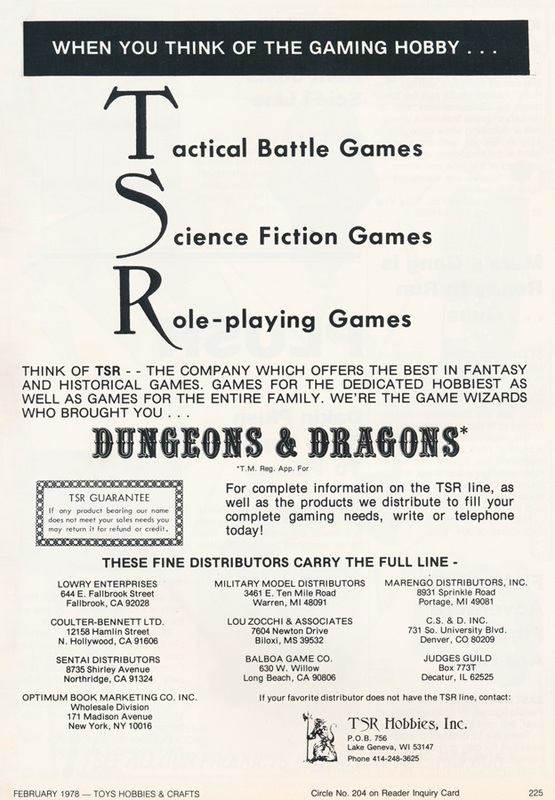 By 1977, the three letters "TSR" had long since lost their original association with Tactical Studies Rules. 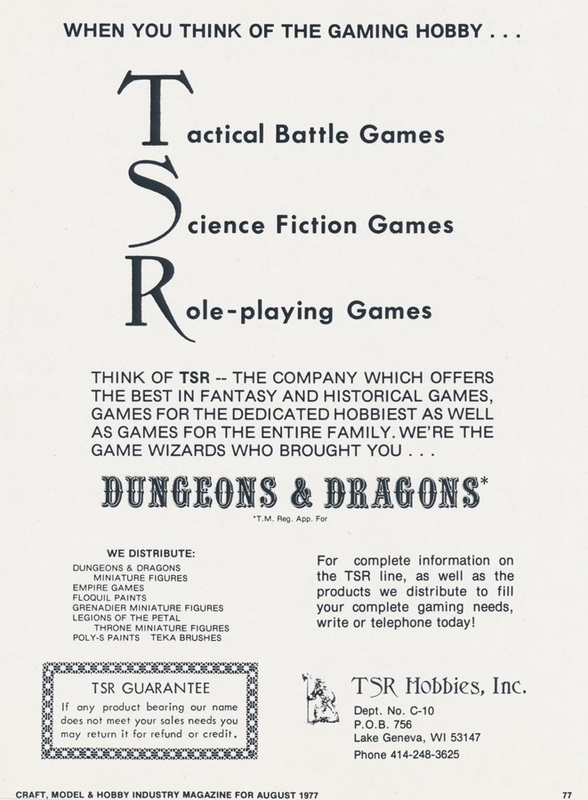 This let TSR Hobbies play with the acronym as a mnemonic for its three product silos: traditional tactical wargames, science-fiction games like Star Probe and Star Empires, and finally role-playing games, led by Dungeons & Dragons. 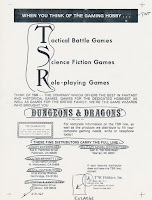 That was TSR's umbrella, and when the industry thought of the gaming hobby, TSR hoped it would think of its tactical, sci-fi and role-playing games. The company was still small enough at this point for Gary Gygax to micromanage how they presented this message, as his hand corrections to the advertisement here show in a surviving TSR internal document. A version implementing some of Gygax's requested corrections, such as enlarging the lizardman, could be found in the wild in the October 1977 issue of both Toys and Playthings. We find it in those industry trade journals rather than The Dragon or White Dwarf because it was not a consumer-facing advertisement, but instead one targeting hobby store owners. We can recognize advertisements for this audience by their "TSR Guarantee" which became common in 1977 industry ads, promising retailers reimbursements if any product "does not meet your sales needs." Since the advertisement appeared in black-and-white, it was hard to implement the "tint" that Gygax requested for the bar at the top reading "When you think of the gaming hobby..." Some versions of the advertisement simply have that text in normal lettering, like this example from the August 1977 Craft, Model & Hobby. That version, rather than enumerating distributors, instead lists what TSR itself distributes beyond its own products, largely focusing on miniature figures as well as accessories for their care and upkeep, like paints and brushes. We can still see this basic ad in use early in 1978, as in the February issue of Toys, Hobbies, & Crafts, by which time the list of distributors has grown a bit. Astute observers might have noted some slight variation in the department number in TSR's mailing addresses, a response-tracking technique which has covered here before. The pattern for these industry magazine advertisements seems to lead with a "C" and list a sequential numerical code: we see C-10 and C-11 above, for example. The Playthings advertisement lists Dept. C-12, the same code we see in other contemporary TSR ads in Playthings, which suggests these codes identified the journal where the advertisement appeared rather than the advertisement.Toys directs you to Dept. C-15, and a version in the January 1978 Toy & Hobby World lists Dept C-30. 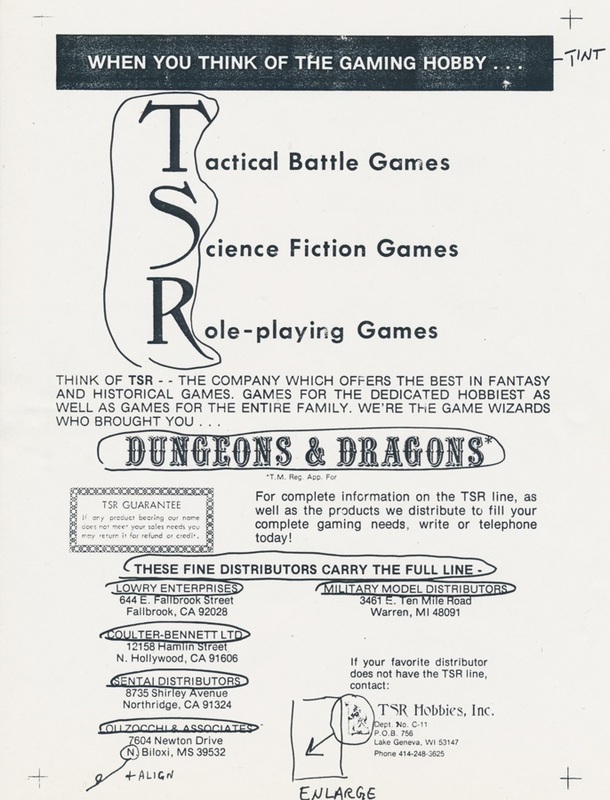 All that would suggest there were probably more than twenty industry journals where TSR tracked placed advertisements at the time, and perhaps more than thirty. Their advertising budget grew proportionately with the success of Dungeons & Dragons, which enabled them to aspire to a loftier position in the hobby games business. Previously on Vintage Ads: Slain Any Wicked Dragons Lately? Gygax may not have been the best writer, but he knew his layouts! Zines with limited space will do that to you.